I visited the Liberty Memorial here in Kansas City the other evening at about the end of dusk. I’m not a monument visitor as a rule, but I wanted – let’s say I needed – to make a photograph before the end of my day. It’s an impressive experience – the approach, the broad terraces and the 200 foot tower, inscriptions and plaques, on a hill overlooking the core of downtown. The traditional shots have all been done so beautifully, in all kinds of weather and memorable light. As usual, I wanted an unexpected view, that you won’t find in a book, that will never spin with the happy postcards on the rack at the gift shop. People came and went, gathered in clusters with phones at arm’s length, looking out, looking up, and of course looking at themselves. There was an engagement photo session with a light on a stand, and groups and couples watching the last of the sunset sidelight the skyline. Ninety years this has stood, but I think it looks the same today as on the day of its dedication. I’m impressed by the designers whose creativity and vision built a stone and steel icon that is ageless today. I could feel the power of the structure’s intent, and the presence of people who have paid their respects. I decided to shoot from the side, not head on, with just the base in the frame but the tower unseen. (This will never make the guide books. If you haven’t been there you’d never know where it is. But that kind of picture was not my intent). I waited for people to pass through my frame so the space could be empty, and timeless, with no reference to now that a proper Nat Geo photographer would include. And I blocked the right side of the tower’s fluted shaft to connect the two parts of the picture with no break from a second sliver of sky, and to lead the eye around that obstacle to get to the message, set back at the edge in both space and in time. 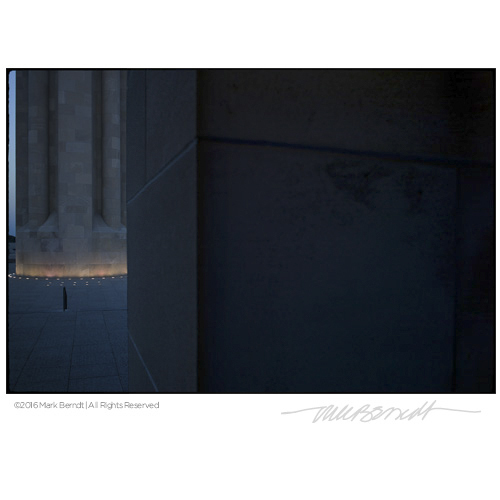 This image, read left-to-right, is a 1/4-frame tribute to lives lost in World War One, and 3/4-frame blackness of cut limestone blocks on the right that is Time, as Time soldiers on. It’s our failure to learn. It’s our choice to repeat. It’s the heaviest part of the picture; the weight of wars waged and the count of lives lost, in The War to End All Wars – and all of the wars that then followed that war – right up to today.